Order Desk can submit your print on demand orders to Pic the Gift. When Pic the Gift fulfills your orders, the shipment info will be pulled back into Order Desk automatically and sent back to the original shopping cart, if your store is set up for this. 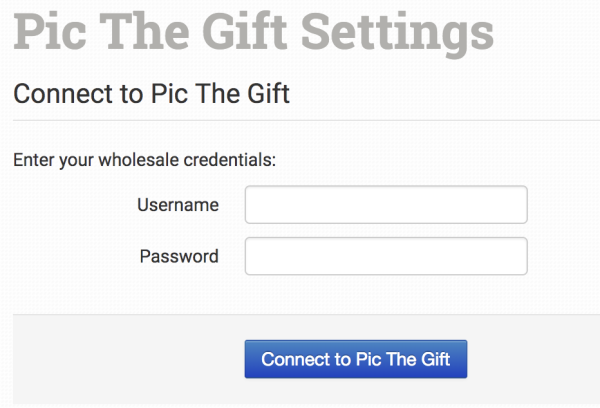 This guide explains how to set up and begin using the Pic the Gift integration. To connect to your Pic the Gift account, click on Manage Integrations in the left sidebar. Under the Print on Demand tab, look for and enable the Pic the Gift integration. Once enabled, enter your Pic the Gift wholesale credentials and click to connect. Choose the folder where orders should be moved to after they are successfully sent to Pic the Gift. Choose the folder where orders should be moved to as Pic the Gift sends tracking details back. Set your default return address for Pic the Gift to use on your order shipments. If you need to customize the return address for certain orders, you can save different return addresses to your Store Settings and then use a rule to set the return address to specific orders. If a return address is not added to the order, the default address set here in the Pic the Gift settings will be used. For more information on what the product settings within the Pic the Gift integration do, please read the Print on Demand Product Settings guide. Getting your orders ready to send to Pic the Gift takes some setup time. For detailed instructions on how to use Order Desk with your print on demand orders, please take a few moments to read through the Print on Demand Fulfillment guide. EventName Group orders together for batch printing. Handling Available values are 24, URG, and RUSH. print_sku The Pic the Gift Part Number. Not required if you want to pass in the order and mark it as held. print_url Link to your artwork file. print_url_1 is also accepted. Not required if you want to pass in the order and mark it as held. print_url_2 Optional. Link to a second artwork file to be printed on the same item. personalization_text_x Personalization text for the print. Available in values 1 through 15.